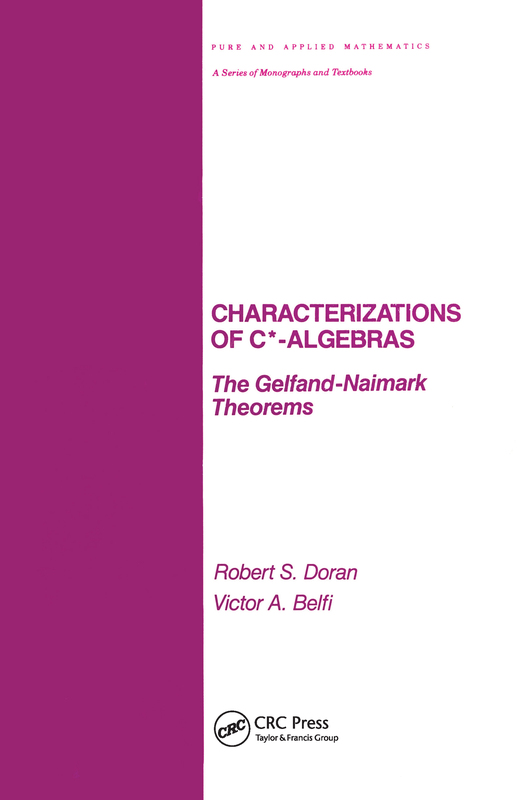 The first unified, in-depth discussion of the now classical Gelfand-Naimark theorems, thiscomprehensive text assesses the current status of modern analysis regarding both Banachand C*-algebras.Characterizations of C*-Algebras: The Gelfand-Naimark Theorems focuses on general theoryand basic properties in accordance with readers' needs … provides complete proofs of theGelfand-Naimark theorems as well as refinements and extensions of the original axioms. . . gives applications of the theorems to topology, harmonic analysis. operator theory.group representations, and other topics … treats Hermitian and symmetric *-algebras.algebras with and without identity, and algebras with arbitrary (possibly discontinuous)involutions . . . includes some 300 end-of-chapter exercises . . . offers appendices on functionalanalysis and Banach algebras … and contains numerous examples and over 400 referencesthat illustrate important concepts and encourage further research.Characterizations of C*-Algebras: The Gelfand-Naimark Theorems is an ideal text for graduatestudents taking such courses as The Theory of Banach Algebras and C*-Algebras: inaddition , it makes an outstanding reference for physicists, research mathematicians in analysis,and applied scientists using C*-algebras in such areas as statistical mechanics, quantumtheory. and physical chemistry.